These pretty while flowers caught my eye as I was shopping for poinsettias the other day. I have grown the hardy cyclamens outdoors. They were a pink variety that nodded their heads barely 2 inches above the ground. These tender blooms originating in Southern Europe and Asia are taller. I'm told they will bloom for a month or so, die back, and then bloom again in spring. It was recommended to me that I water them from the bottom as the tuber will draw water up through the drainage hole. We'll see how they do. 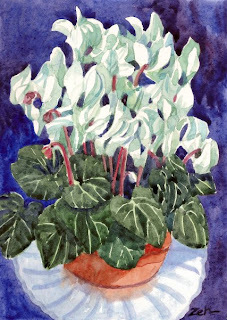 It was both challenging and fun to paint this plant with its many curving petals, its veined leaves and little droopy buds . I like how the white flowers pop against the deep plum-colored background.